This beautiful flower has been termed the Crocus of America. There are about fourteen species of low-growing bulbous plants, with grassy leaves, which appear in spring with or before the Crocus-like flowers, which are white or rosy-pink, large and handsome. Zephyranthes require rest during winter, and at that season are best kept dry. In spring they should be planted out in the full sun in sandy soil. They do well in the greenhouse, four or six being planted in a pot. Atamasco Lily (Zephyranthes Atamasco) - A native of N. America, where it is a conspicuous ornament of damp places in woods and fields. Its glossy leaves appear at the same time as the blossoms, and slightly exceed them in height. The white flowers are striped with rose, are about 3 inches long, and borne singly upon a scape 6 inches high. Flowers from May to July, and is very beautiful where it succeeds, but it is seldom really happy with us in the open air, even in light soils and in the warmest gardens. Swamp Zephyr flower (Zephyranthes Candida) - The hardiest and best of the group, making tufts of evergreen Rush-like leaves, and glistening white flowers with golden stamens, opening flat in the sunshine from August to October. The buds are prettily shaded with rose on the outside. In warm sandy soils the bulbs do well, planted like the Belladonna Lily in narrow borders against a greenhouse or any place-even a gravel walk-where they get a thorough baking and plenty of moisture from time to time. Cool and heavy soils do not suit the plant at all, nor does it seem to do so well in the west as in the drier climate of E. and S.E. Britain, often failing to flower when it does not die out. In the light soils of Surrey and at Kew it is charming, ripening seeds which germinate and grow readily, spreading into groups of beautiful effect as an edging to warm borders, or even as a carpet plant. Z. citrina is a scarcer kind allied to candida, but distinct in form and in its golden flowers. A cross between these two species has given Z. Ajax, which is like candida in character and time of bloom, but quite new in its soft yellow flowers, over 2 inches across, prettily flushed with rose on the outside. Zephyranthes Carinata - This lovely plant has narrow leaves, and its flower stem, which is about 6 inches high, bears a delicate rosy flower, 2 or 3 inches long. It blossoms freely in the open border if kept dry in winter, and should be grown in light sandy loam. S. America. Zephyranthes Macrosiphon - A scarcer plant coming near carinata, the flowers a little smaller but more abundant, and sometimes renewed in autumn. Easily grown and seeds freely, but unless amply protected the bulbs should be lifted in the autumn. Zephyranthes Rosea - A beautiful species, with flowers of a bright rose, is a native of the mountains of Cuba. 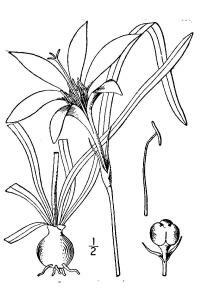 Zephyranthes Treatiae - Resembles Z. Atamasco, but is found in damper places and blooms somewhat later-April to June. The leaves are weak and narrow, and the bulbs so small that the large white flowers, 3 inches long, flushed with red while in bud and delicately fragrant, come as something of a surprise. If grown in the open air it should be in a warm border like that recommended for Z. candida, with a good layer of ashes to protect the roots in winter. Florida. Zephyranthes Tubispatha - A handsome plant, bearing a white, slightly fragrant flower, 2 or 3 inches long. Native of Antigua, and of the Blue Mountains of Jamaica. Though a stove plant, it will thrive and flower well in mild localities, if well protected in winter. A pretty pink hybrid between this species and Z. carinata is sometimes met with under the name of Z. Spofforthiana.